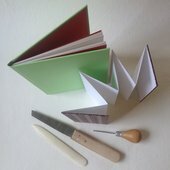 Spend the day at Tate St Ives learning some traditional bookbinding skills with tutor, Megan Stallworthy. 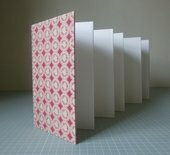 During the workshop you will make a sewn, hard-cover sketchbook and a concertina book to take home. Megan is a member of the Devon Guild of Craftsmen and teaches bookbinding at art centres, book festivals, colleges and universities in Devon, Cornwall and Somerset. All the materials are provided, plus refreshements and a tasty lunch.